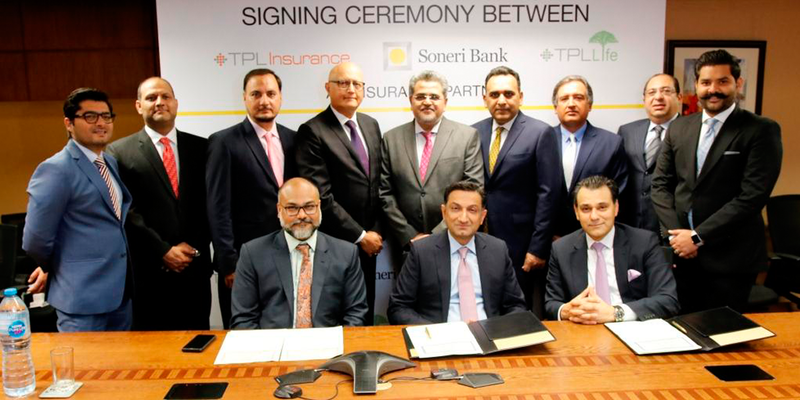 Karachi: 11th March 2019 – TPL Insurance and TPL Life are Pakistan’s leading enterprises in innovative insurance business and have signed a ‘Master Agency Agreement’ with the prestigious Soneri Bank Limited. The partnership will provide customers with coverage of vehicles by TPL Insurance, while their life-risks will be covered through the TPL Life Bancassurance product. The agreement was signed at a ceremony held at Soneri Bank – Karachi to commemorate the partnership aimed at expanding insurance and banking collaborations in the market. The three partners aim to work cohesively and in future hope to explore many other avenues of business to generate more benefits and accelerate business growth. Soneri Bank offers world-class banking services with its presence and comprehensive network of 291 branches spread across all the big cities and commercially important towns of Pakistan. It also operates 21 Islamic banking branches and over 300 ATM machines in the country. Mr. Amin A. Feerasta – Executive Director, Soneri Bank expressed his delight on this strategic alliance stating, “we are proud to announce our partnership with TPL insurance for combining our strengths and bringing value added products for our customers. Soneri Bank with its ethos of Roshan Har Qadam has always strived to bring betterment to the life of its customers and these innovative solutions is a step forward in enriching the lives of many. We look forward to bringing new collaborative products in the future”. During the signing ceremony, Mr. Aminuddin, Mr. Feerasta and Mr. Abbasi were accompanied by their companies’ senior officials, including: Mr. Syed Ather Abbas – Deputy Managing Director, TPL Insurance, Mr. Aurangzeb Siddiqui – Head of FIG, TPL Insurance, along with Mr. Humayoon Asghar – Head of Business Solutions and innovation, TPL life and Mr. Muneer Khan – Head of Commercial and Corporate Business, TPL Life. Soneri Bank was represented by Mr. Mohammad Aftab Manzoor – CEO, Mr. Mirza Zafar Baig – CFO, Zulfiqar Lehri – Head of Consumer Banking, Mr. Muhammad Qaisar – Head of Corporate & Investment Banking and Mr. Shahid Abdullah–Head of Treasury, Capital Market, PRI & FI.